How much money do you make? If we come across such questions, we definitely mind replying to them unless the person is someone really close to us. To others, we may reply in neutral or simply tell them that it is none of their business. Though, there are certain people who do ask such types of questions, but actually it is really unprofessional to ask about it. 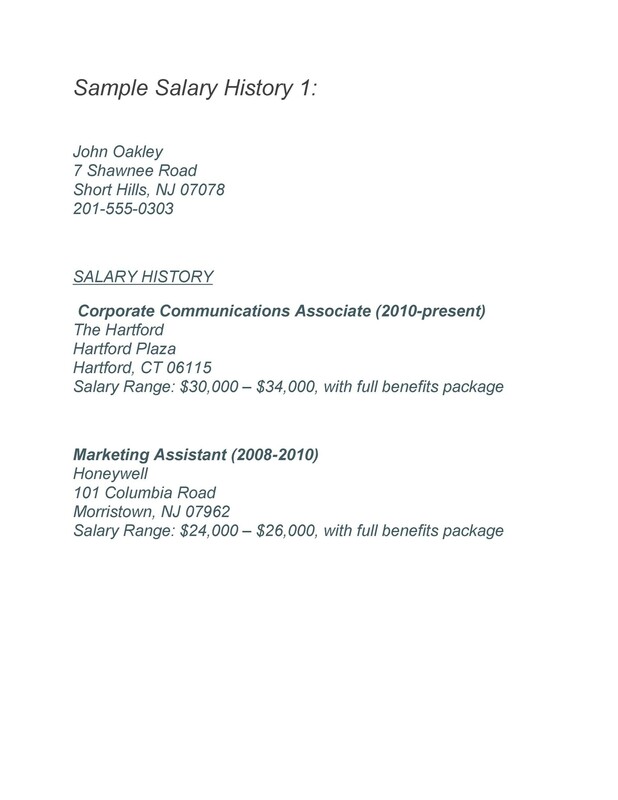 2 What Salary History Actually Is? 4 How Can a Salary History Be of Help for the Employers? Besides people around you, what if an employer asks you about your salary? Well, this is a question that many companies ask and you may find yourself at a loss as to how to answer such questions, because here you can neither reply nor be rude. 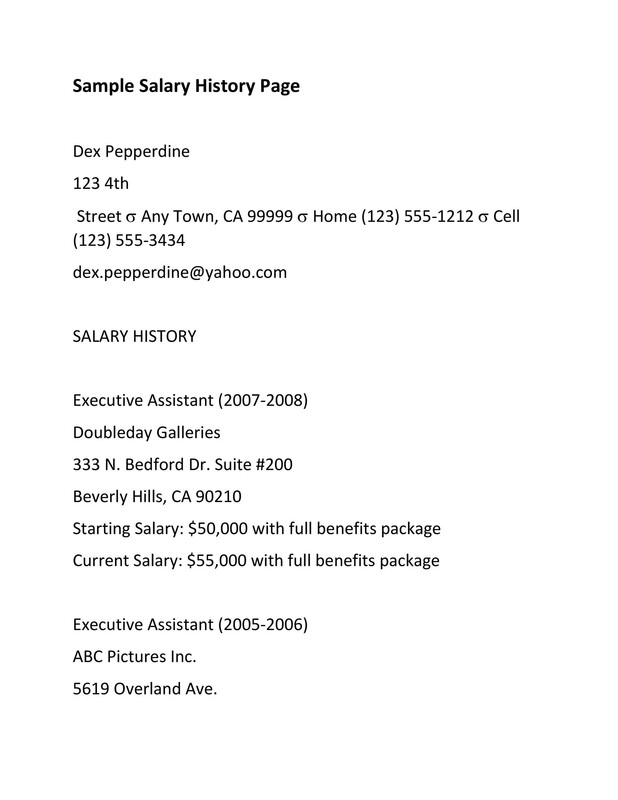 Some firms directly ask question about your salary package while some of them ask for your entire salary history. 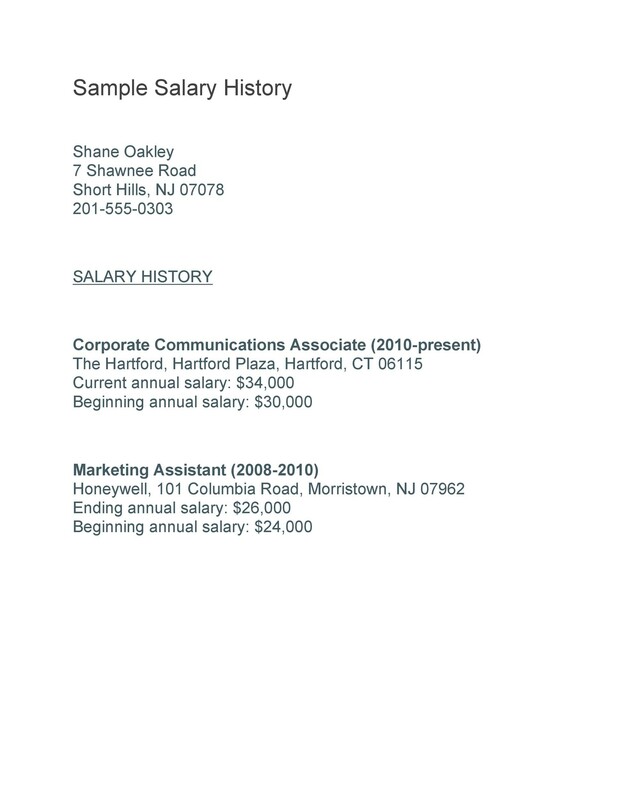 At times, some employers ask for the salary history in the job postings for the offered position. You need to be very careful when disclosing about your salary package or history as it is linked with your potential salary package. But if the job posting does not mention about the salary history, then you do not have to provide any salary information. However, maintaining salary history can be of help for you in case you require it for other employers. In order to know more about salary history in detail, read through this article. 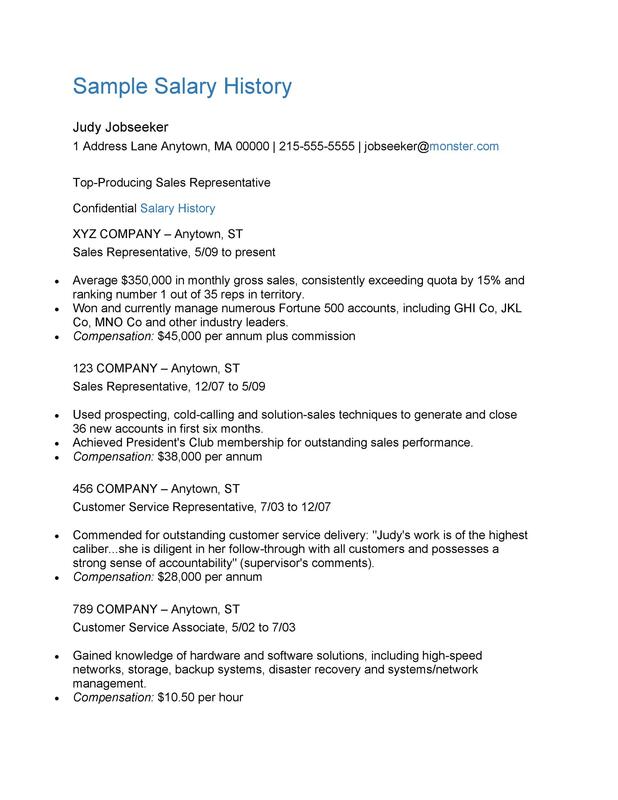 What Salary History Actually Is? 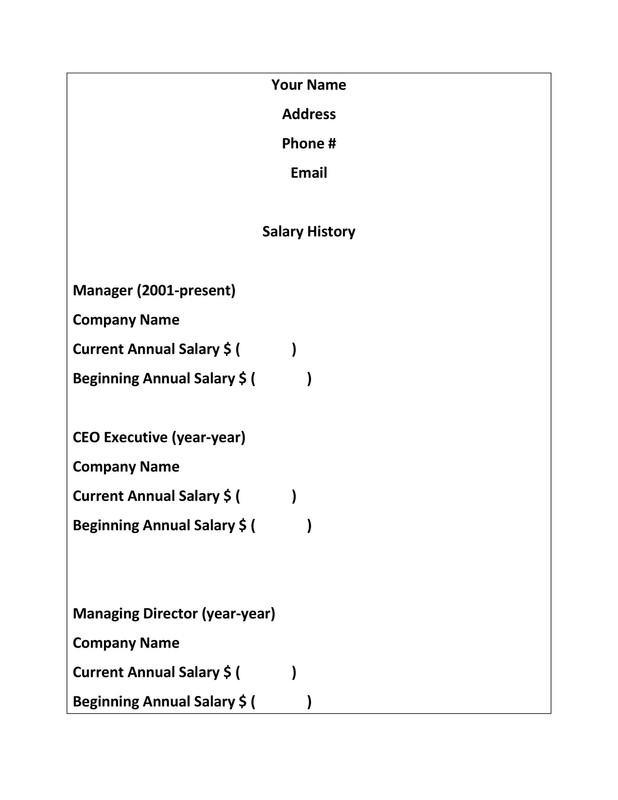 A salary history is a form of document which presents the past earnings of the employee. 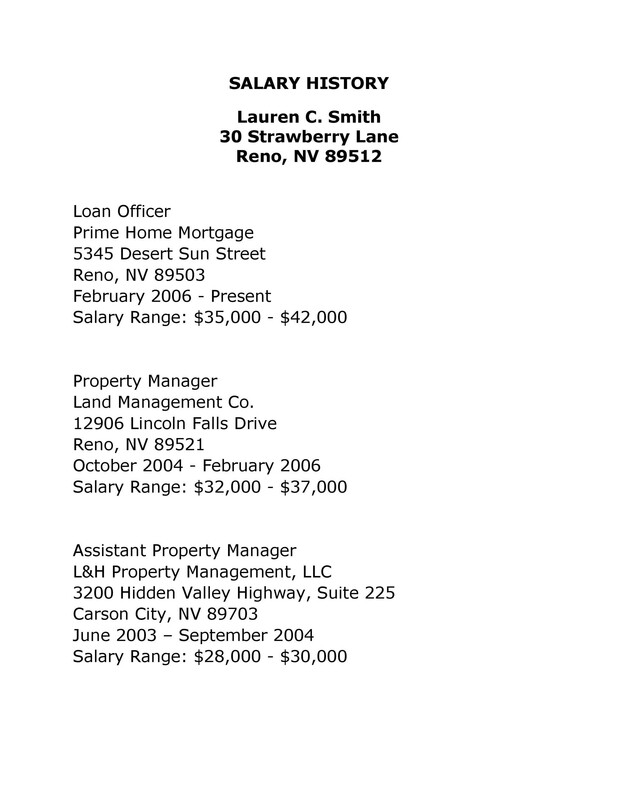 Employers often ask for the salary history from the applicants when they apply for the job. Generally, a salary history includes a job title, salary, name of the employer and benefits package earned by the employee in the past. Also, some people often get confused between salary requirement and salary history. These are two different aspects. Salary requirement is the salary that is expected by the employee for the specific job position. 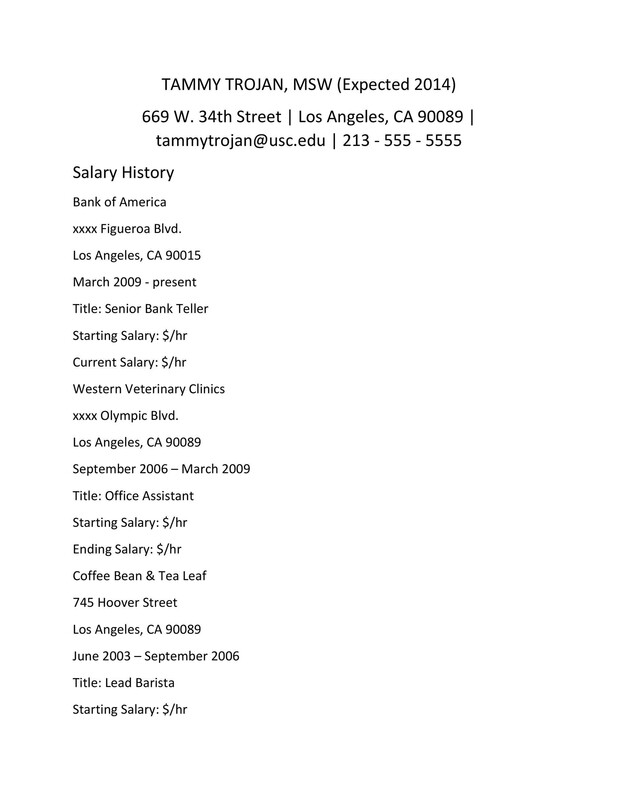 Salary history, on the other hand, is the record of all the salaries you had up till now. It is quite simple to form, not requiring much hard work or effort as you just have to write down the name of the company, list your job title and mention your salary for each job in chronological order from your first to most recent job. 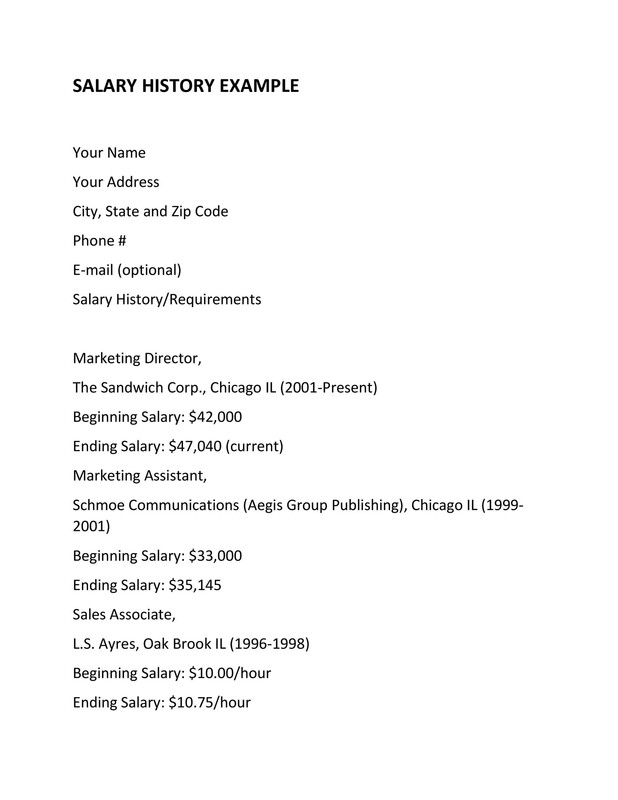 When is the Salary History Asked? Generally, the employers look for the salary history at the time of job posting during the interview or during the telephone screening. This opportunity gives the ease to the employees and they can decide whether they want to reveal their private information or not, in advance. There are certain employers who at times may not ask for the salary history in the job posting, but they may ask for the history during the interview. Most of the employers opt for asking about the salary during the interview because the applicant is quite under pressure and may desperately want the position too, therefore they tend to respond to them. According to experts, companies should not do this as most of the applicants are not ready for the employers to box them in a corner. Novice applicants likely are found pretty nervous and develop certain responses of their own. Therefore, employers should discard this act of asking about the salary history or salary in general during the interview. They can provide a salary range option to them so that it becomes easier for them as they do not have to tell the specific amount. 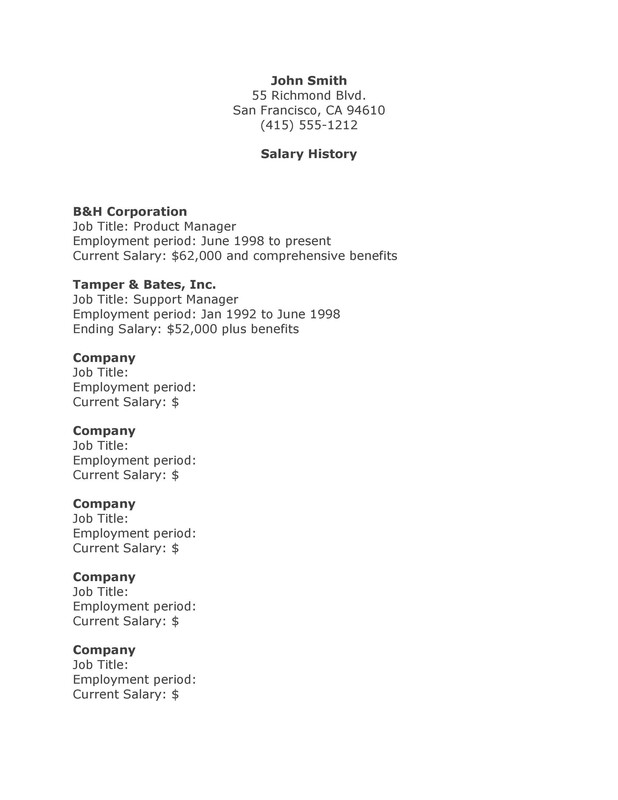 How Can a Salary History Be of Help for the Employers? Well, there are several reasons employers ask for your salary history. 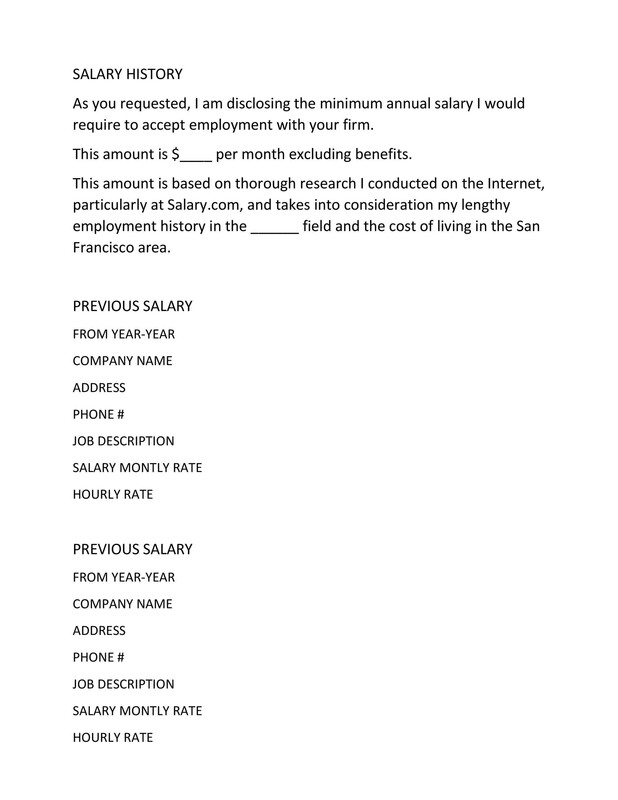 If you are willing to make a salary history for your potential interviews and employers, you can download the salary history template from our main website or consider those salary history samples for your help. Check out some of the reasons for showing salary history to your employers and how can it help them in future. One of the main factors that is determined by providing your salary records and history to the employer is that the employer or the manager is able to know if they can afford to hire you. In addition to your current salary, it also covers the compensation, benefits, and your total salary range. If you are an experienced employee and quite skilled too, then they might consider offering you more than your past employer. If you have applied to a small firm and they see that your salary package and other benefits were high, they would calculate whether they can afford you or not, looking at your salary records. 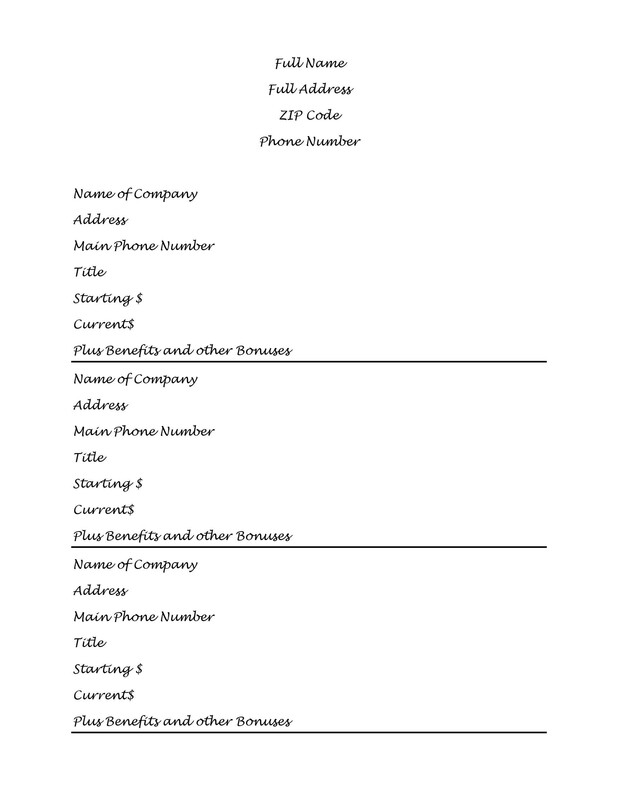 This information would save the applicant and employer’s energy and time. In addition to affordability, when the employer sees the salary record, they can come up whether they need to provide you a raise in the salary or not. Additionally, the salary record also tells the manager or the employer if they are able to meet or afford your expectations or not. Along with seeing whether the manager can afford you or not, the salary record covers countless benefits and things determining about your success. If an applicant has a salary record and history in which they have increasingly showed great progress, it determines that they are a highly competent employee and are a successful one. Of course, with a good salary record, it shows that an applicant was pretty ambitious and successful in their previous workplace which can make you a desirable employee too. Similar to the previous one, a salary record does not only highlight the salary, it also determines about the benefits and compensation your employer gave you. Additionally, it also determines that the employers did their homework regarding your compensation package. With this package, the potential employer will get to know about your value and worth, ensuring to provide you market competent salary package for the job and also helps them give an idea as to what they should offer you for the employment. Now that you know that employers may also ask for your salary records or history, you should be ready and prepare one beforehand. Here are certain things that you should consider before providing a salary record. Check them out below. Firstly, you need to see the scope of the job before you discuss about your salary. Additionally, it also becomes difficult with respect to compensation as you do not have sufficient information about the level of responsibility and position. Secondly, you should also research and survey the job market before the interview in order to get an idea of what the job position is really worth. You should always go with the rate for the similar job position from a person having similar experience and skills as you. Thirdly, you should also consider the timings. If there are different processes involved in an interview, it is good to delay giving your salary record depending on which stage of interview you are. This delay is necessary because that would help you determine about the interest of the employer. Lastly, you should keep in mind that you do have to reveal about your salary at some stage for sure during the interview process. But when you postpone the discussion, you have more control over the situation. Consequently, make sure to provide salary record when you think it is in your best interest. Also, then it will make it easier for you to discuss about the compensation. So, at some point during the interview, you will surely be asked about the salary package you were getting in your previous job. 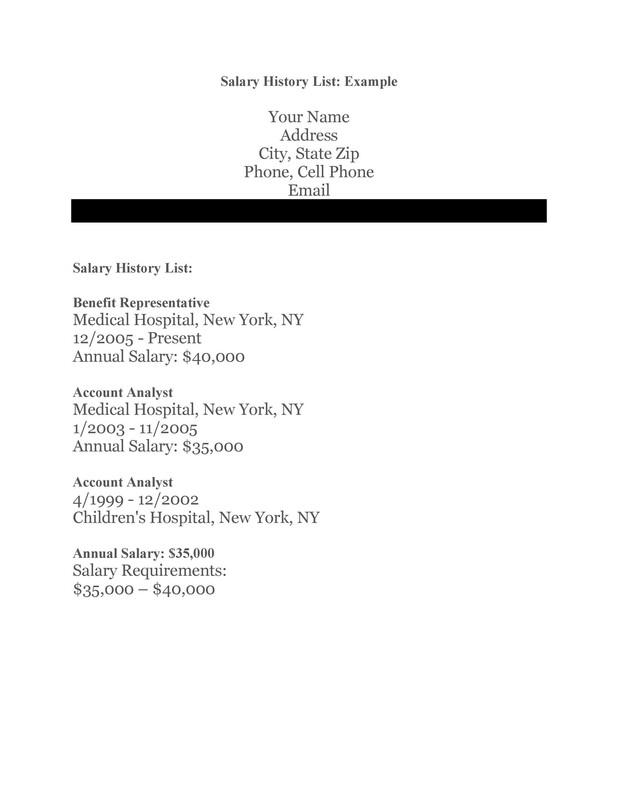 One of the common ways chosen by the employers is to ask about your salary record. You need to be very careful when you are presenting your salary history as it can either make or break your potential job interview and position. Therefore, here are some tactics for your salary record so that you are able to present it in the best possible manner. Though, there are many employers who ask for the salary records or simply ask for your previous salary, at the same time, there are some employers who do not ask for it. So, why tell anyone when they have not asked for the salary? Make sure that you play it the right way. If the employer has asked for it, do not skip telling about it, but if they have not asked for your salary, you ought to tell about it and make sure that you do not skip it which leads us to our next point. 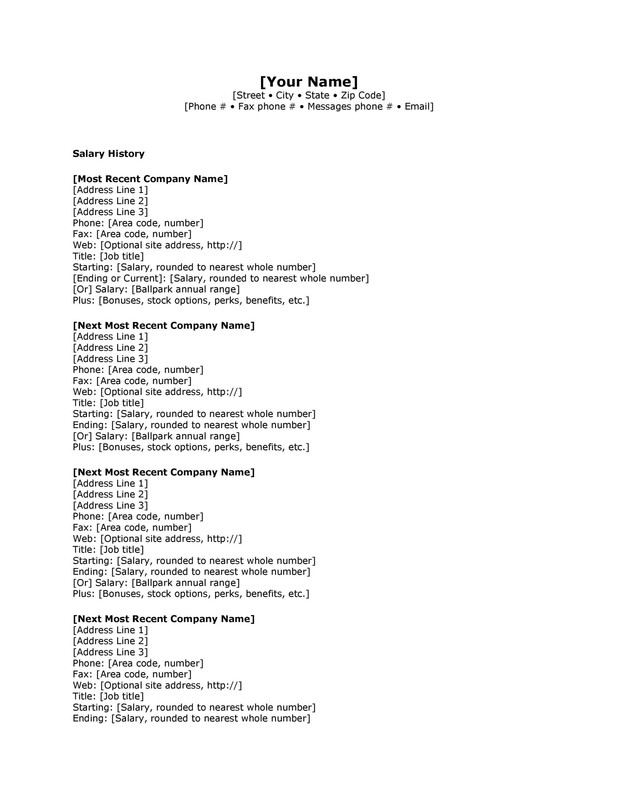 Nowadays, most of the jobs specifically ask for the salary record on the job application, you should better not ignore the request or skip telling about it ever. Always remember that an incomplete job application likely goes in the trashcan, so you should not give the employers an easy way out, throwing your application away or not considering it at all. Consequently, you should make sure that you do provide the salary record to the employer. In addition to not skipping about the salary record, you should also be showing how your salary progressed. Of course, the salary record outlines of what your salary has been in the past and how it has shown progress. 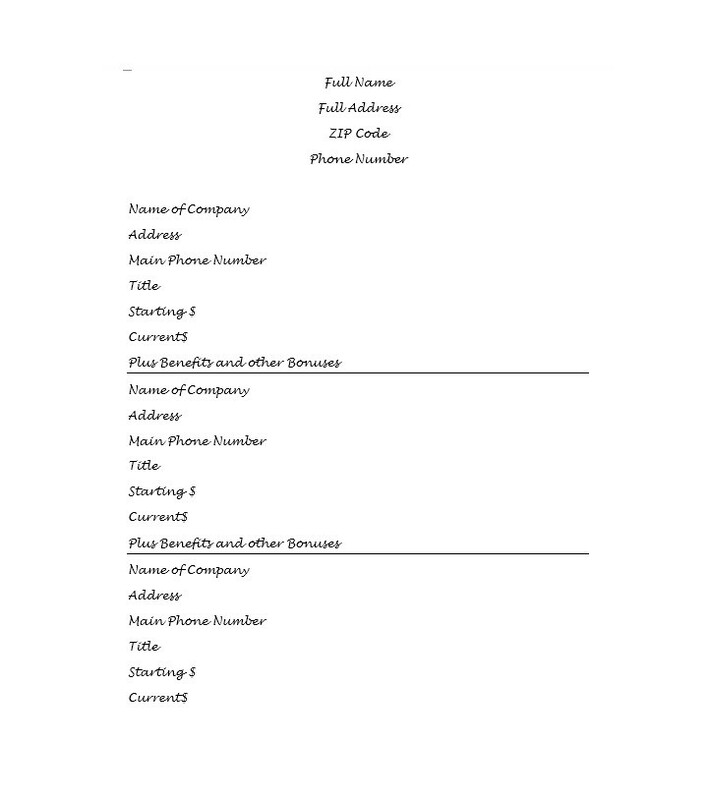 You should include a sheet with your resume and cover letter including all about your professional positions such as fulltime, half time including the timings and name of the companies. Make sure that you highlight each and every position in the salary record. 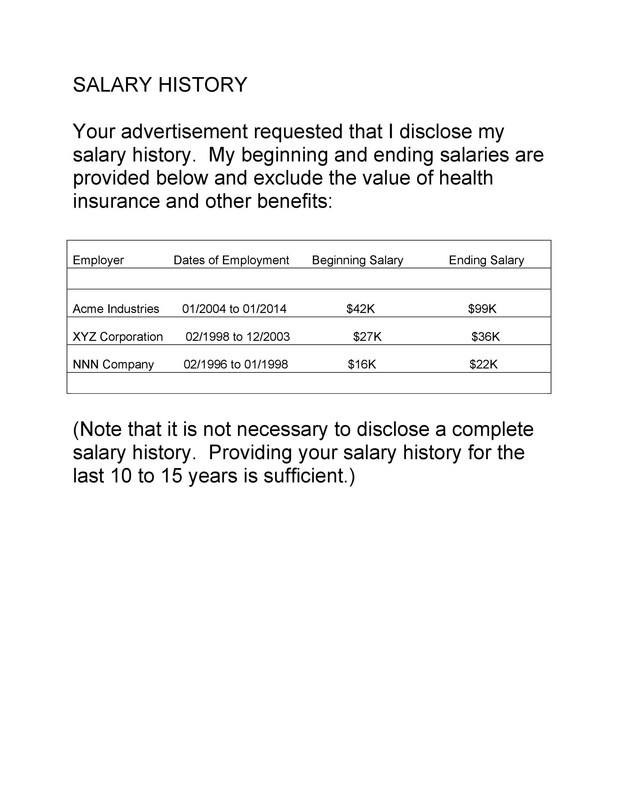 The salary record or history can be a great way to determine how your salary has progressed. One of the main things that you should keep in mind is not to lie about your salary. This will discredit you as an applicant. While you may think that the potential employer may not really know about your past salaries, you should remember that lie does not hide for longer. Additionally, there are certain companies which even check the salary record more often than applicants think. If you have provided the salary record to the potential employer, make sure that it is true, genuine and accurate one, as the potential employers do cross check the salary you have provided with the name of the companies. Providing incorrect of false salary records can ultimately backfire at you. It is a good idea to provide salary requirement or expectation towards the potential job position. This can make the employer feel that you are professional and organized candidate, giving them an expectation for your potential salary. Also, this can reduce the chances of getting a less salary package of what you are not worthy of. But including the salary requirement and expectation would likely give you an increase in the salary. Now that you know you do require a salary record for applying for different employers, you can take help from our samples and templates for the salary history from our main website and use it in order to form the salary record. 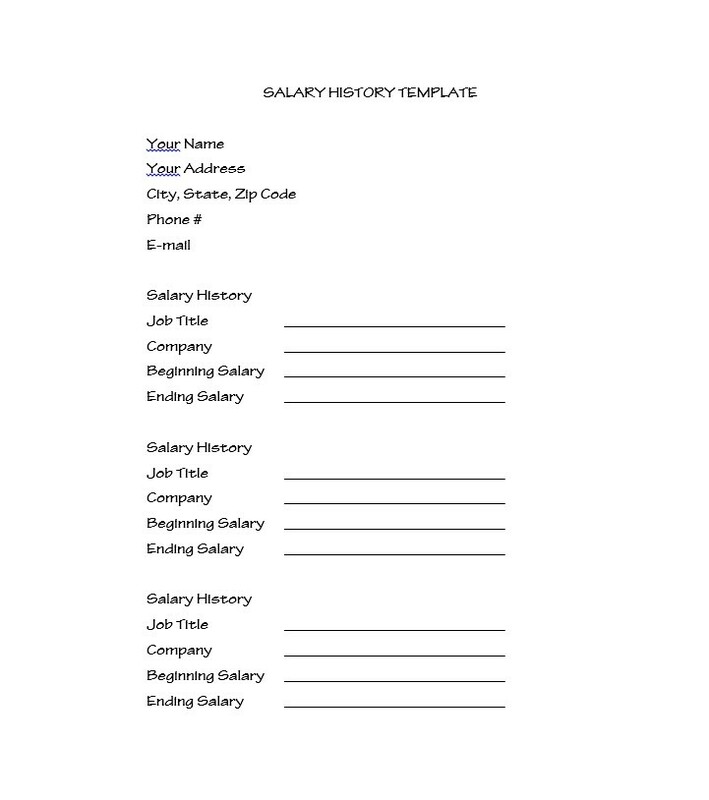 We hope our templates help you getting a better salary this time around. Good luck!